Join "It's a Wonderful Life" on Facebook. click here. Oh What a Wonderful Show..! And that is the plan. With the possibility of a bigger venue on the horizon, there is every reason to expect this production to become even bigger and better in 2011. A new feature of this year's production was an audience ice-breaker: an excellent rendition the classic Abbott and Costello "Who's on First", performed by Scott Vige' and Glen Hobgood. Highlighting the main presentation, local voice actor Bill Lee again pulled off the near-impossible: a believable impersonation of the often poorly-imitated James Stewart as the lost soul George Bailey, who threatens to commit suicide until he sees what Bedford Falls would have been like without him. However, Lee’s impersonation is the only one in the cast, the others each choosing to present their own characterizations of the other roles in the nation’s most-loved Holiday movie. Not least of which were those of the evil Henry Potter, the “pantomime villain” of the story, played by Greg Beaumont; and the Angel Clarence, whom British voice-actor and production director Stephen James, a resident of New Orleans, brought to a new perspective as a cheeky cockney. Leading lady and local voice actress Karlin Tessier also provided a powerful and dynamic interpretation of Mary Hatch Bailey, wife of George, whose patience is extended almost to the limit by George’s roller-coaster personality; while also powerful in her interpretation of the Supervisor of the Angels was Terry Spitale who brought a sense of grace and superiority to her role. Alaraby Johnson adapted to her multiple roles with aplomb, one moment playing the flirt as Violet Bick (to whom George makes a loan, raising the odd eyebrow among the townsfolk of Bedford Falls), while the next she is interrupting a board meeting with the authentic squawks of “Jimmy the Bird”. Similarly versatile with multiple roles were local pharmacist Al Spitale, who played Gower the fallen apothecary as well as the cab-driver and an authentic Italian café-owner; Hal Pluché as the young George (whose voice had evidently yet to break), John Tran, Paul Watson, Richard Louis, and Scott Smith. Special mention should go also to the sound team of Stuart Lob and Elizabeth Lanier, who were able to time the background music (written by Jonathan Green) and sound effects (produced by Tony Palermo, who also wrote the radio-play adaptation) to perfection. The production, held at Zeigeist Multi-disciplinary Arts Center, was also broadcast live this year for the first time by Baton Rouge-based Andco Sports and Entertainment – taking the performance and the culture of New Orleans worldwide via the internet. For those who attended the performance live, or listened to the broadcast, this was a most enjoyable peek into 1940s-style broadcasting at its best – and with a smattering of New Orleans and current affairs references sprinkled into the script. For those who missed it: they missed a treat. But you can still listen to an archive of the event or, even better, make sure you don’t miss next year’s annual “It’s a Wonderful Life” radio-play from NOLA Voice Talent. 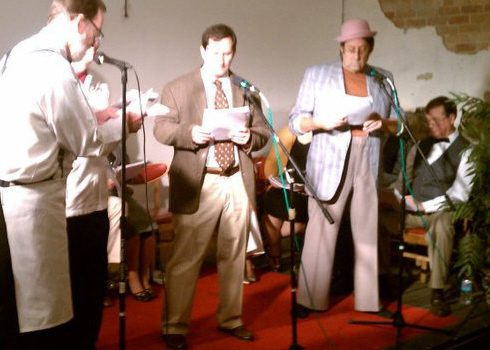 The 2010 annual NOLA benefit radio-play production of "It's a Wonderful Life"
While you are free to enjoy the broadcast at no charge, the purpose of the production is to raise funds for charity. Therefore, you are invited to make a donation direct to Common Ground Relief through JustGive.org by clicking on the link towards the top of this page or on the broadcast web-page. Click on the link above to view the "It's a Wonderful Life" trailer-video on You Tube. Please copy-and-paste the link and forward it to your friends too!. Crank up your volume and click on the players above to hear audio previews of this year's performance; narrated by Sydney Beaumont (also playing Mary Bailey and Janie Bailey), with Bill Lee (George Bailey, Mother Bailey) and Stephen James (Clarence, Harry Bailey). Trailers written by Bill Lee, directed and produced by Stephen James. 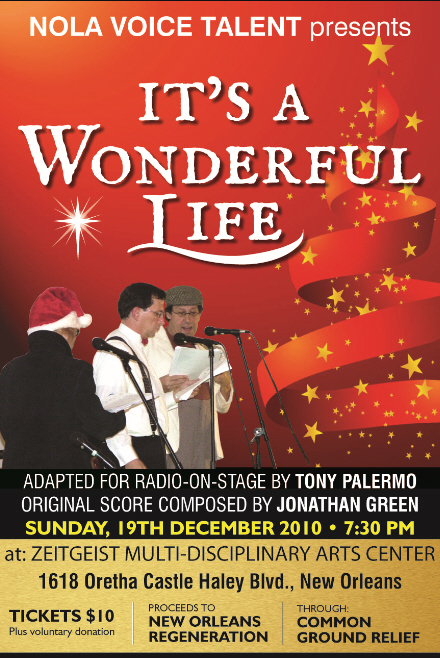 "It's a Wonderful Life" radio-play script by Tony Palermo; original score composed by Jonathan Green. This year's poster for the annual NOLA "It's a Wonderful Life" NOLA benefit radio-play has finally been produced and will hit the streets in the next few days. The poster was produced by Sir Speedy New Orleans from concepts by local artist Carol Hallock, and again features a stunning red background. Unlike last year's poster, the design no longer features the names of the leading cast members, which were featured in cinema-poster style for the 2009 performance. "This is a team effort," remarked Director and Co-producer Stephen James. "So we decided not to feature any individual's names on this year's poster. Last years cast did a remarkable job and in a very short time. Already this year, the cast has produced some 'goose-bumps' moments in rehearsals!" Last year's poster has become a collectors' item, and a limited number of those will be available for sale at this year's performance. In addition, a framed poster of the 2009 performance, signed by all last years actors and crew, will be featured in a silent auction, with sealed bids being accepted between now and the performance and opened at the Interval; with proceeds from that and other sales to be added to funds raised for Common Ground Relief. NOLA Voice Talent launches second annual NOLA benefit radio-play of "It's a Wonderful Life"
Members of New Orleans voice-acting group NOLA Voice Talent have regrouped for rehearsals of the second annual radio-play production of the Tony Capra movie classic "It's a Wonderful Life", to benefit regeneration in and around New Orleans. Local actor Bill Lee will again be taking the starring role as George Bailey (played by James Stewart in the movie) to repeat his dream-come-true to perform in such a production. "It's hard to believe that only a year ago I met Stephen James and told him how much I had always wanted to play the part of George Bailey," said BIll. "And now we are preparing the show for a second year!" 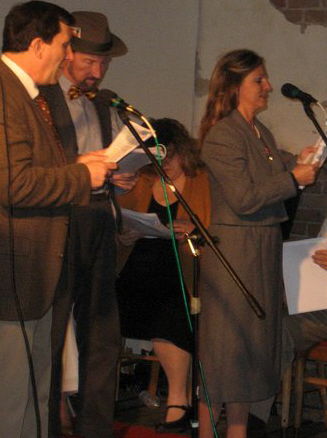 Bill was the only member of the cast who impersonated anyof the movie actors, and his James Stewart voice was a big hit with the audience who gave a standing ovation at the end of last year's performance, which raised $1,000 for NOLA regeneration through the non-profit organization Common Ground Relief. English voice-actor and coach Stephen James, a resident of New Orleans, played the oafish Angel Clarence in his quest to get his wings by saving George Bailey from taking his own life and showing him just what life for everyone else would have been like without him. James, who is again the show's Director, is excited about this year's production, remarking: "Getting the first show off the ground last year was a huge achievement for everyone, not least the cast. With the experience we gained from last year's performance we are looking forward to making the show even more special, as it enters New Orleans culture as a regular annual occurence. "On the basis of our success last year we are expecting even greater sponsorship to benefit the New Orleans region," he concluded. Click here to see reports and photos from last year's benefit production of "It's a Wonderful Life". Los Angeles-based scriptwriter, dramatist, and sound-effects expert Tony Palermo has again agreed to support NOLA Voice Talent in this year's benefit production of "It's a Wonderful Life". "Tony is a huge fan of New Orleans," exclaimed production director Stephen James. "After the success of last year's show, he had no hesitation at all in agreeing to provide the script, background music, and sound effects again, for this year's production." Tony has written, directed, and scored many radio plays, including those for Public Radio, Museum of TV and Radio, and the UN; both on-stage and in recordings. Genres include soap operas and detective shows, super-heroes and westerns; as well as horror stories, science fiction, and historical dramas. "Indeed, thank you so much for a wonderful workshop this past Thursday night. I felt so welcomed and relaxed and will be at every one of the workshops from now on. I especially a..."
"Thanks so much for being a great teacher... I certainly hope to have you as my long term mentor, friend and agent!"